Like many common names, "marigold" originated from the corruption of a foreign phrase. In this case, the original term was the Anglo-Saxon "merse-mear-gealla" or "marsh-horse-gowl" -- the "marsh marigold." Marigolds came to be associated with the Virgin Mary in the Middle Ages, and the word is often said to be derived from "Mary’s Gold." The term "Baileya" honors Jacob Whitman Bailey (1811-1857), a chemist and botanist best known for his pioneering work using a microscope to study diatoms -- microscopic, single-celled organisms which are neither plant nor animal nor fungi. (Biologists place diatoms in the kingdom Protoctista, which includes algae and slime molds.) "Multiradiata" refers to the numerous ray flowers in each head. The desert-marigold is an annual or short-lived perennial, generally 10 to 30 inches tall with a basal rosette of one- to four-inch long, pinnate wooly, or hairy, leaves. Hairs are an important desert plant adaptation because they both increase light reflection, resulting in lower leaf temperatures, and they block ultraviolet light. Single, one- to two-inch wide flower heads grow on the end of stems up to one foot above the leaves. Both rays (34 to 55) and disks (more than 100) are yellow. Rays are three-lobed. Birds such as black-throated sparrows consume the desert-marigold’s pale tan seeds in fall. Desert-marigolds are one of the most conspicuous spring wildflowers across the arid lands of the southwest. They begin to flower in March and will continue to bloom off and on until November. Rain triggers additional rounds of flowering. They commonly grow on stony slopes and sandy plains and mesas and are most abundant on roadsides, where they may form dense yellow carpets. They range in elevation from 100 to 6500 feet. Their drought tolerance and long flowering season have made the desert-marigold a popular plant in the horticultural world. In May or early fall, one might find flower heads sealed into a ball. This is attributable to larvae of the desert-marigold moth (Schinia miniana), which construct the balls as cocoons, often building them in as little as 20 minutes. Moths in this genus are known as flower moths and are often nocturnal. One study of this plant/animal interaction suggested that the balled flower protected the larvae from predation and lowered the rate of desiccation. Adult desert-marigold moths have ocher colored forewings with two transverse white bands and wine red hindwings. 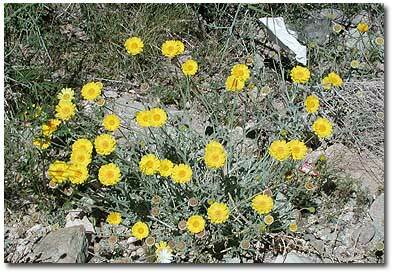 The same study also suggested that the "S. miniana is a major selection agent causing the desert marigold to generate the multiple flowers heads alluded to by its scientific name." The plant ranges across southern Arizona north into southern Nevada and southwestern Utah, south into Mexico, west to the Mojave Desert and east through the Chihuahuan Desert to Texas. Sheep which have consumed desert-marigold on overgrazed lands have sometimes died in large numbers. According to some reports, Texas has suffered flock losses of up to 25 percent. Horses and cattle do not seem to be affected by the plant. Researchers at Arizona State University have extracted several desert-marigold compounds, e.g., fastiglin, baileyolin, and radiatin, which might help in cancer therapy by inhibiting tumor formation.